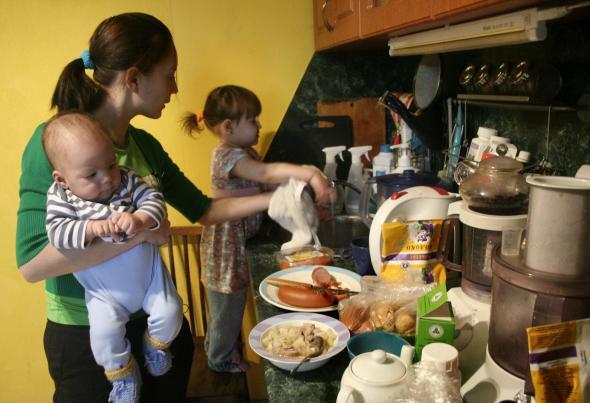 Home-cooked family dinners: A major burden for working mothers. The home-cooked meal has long been romanticized, from ’50s-era sitcoms to the work of star food writer Michael Pollan, who once wrote, “far from oppressing them, the work of cooking approached in the proper spirit offered a kind of fulfillment and deserved an intelligent woman’s attention.” In recent years, the home-cooked meal has increasingly been offered up as the solution to our country’s burgeoning nutrition-related health problems of heart disease and diabetes. But while home-cooked meals are typically healthier than restaurant food, sociologists Sarah Bowen, Sinikka Elliott, and Joslyn Brenton from North Carolina State University argue that the stress that cooking puts on people, particularly women, may not be worth the trade-off. The researchers interviewed 150 mothers from all walks of life and spent 250 hours observing 12 families in-depth, and they found “that time pressures, tradeoffs to save money, and the burden of pleasing others make it difficult for mothers to enact the idealized vision of home-cooked meals advocated by foodies and public health officials.” The mothers they interviewed had largely internalized the social message that “home-cooked meals have become the hallmark of good mothering, stable families, and the ideal of the healthy, productive citizen,” but found that as much as they wanted to achieve that ideal, they didn’t have the time or money to get there. Low-income mothers often have erratic work schedules, making it impossible to have set meal times. Even for middle-class working mothers who are able to be home by 6 p.m., trying to cook a meal while children are demanding attention and other chores need doing becomes overwhelming. The researchers quote food writer Mark Bittman, who says that the goal should be “to get people to see cooking as a joy rather than a burden.” But while cooking “is at times joyful,” they argue, the main reason that people see cooking mostly as a burden is because it is a burden. It’s expensive and time-consuming and often done for a bunch of ingrates who would rather just be eating fast food anyway. If we want women—or gosh, men, too—to see cooking as fun, then these obstacles need to be fixed first. And whatever burden is left needs to be shared.